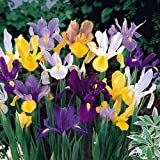 40 Dutch Iris Bulbs, Mixed---Perfect for Fall Planting! Nice 8/9 cm sized bulbs bloom late spring (some of the first of the season!) in Rich Jewel tones. 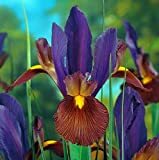 Please note: our shipping stays the same for up to 5 times, so check out our other plants and flowers to make the most of your shipping dollar!